Littlewood Forest is located on the N2 Collon Road, 1 mile from Slane Village and provides a fantastic amenity for walkers. The forest covers 28 hectares (70 acres). Today it comprises a varied mix of conifer and broadleaved tree species. But what is present today is the result of a long and interesting history beginning with the retreat of the glaciers from Ireland about 10,000 years ago. After the glaciers retreated Ireland would have been a tundra-like landscape (with large lakes in the midlands) which slowly became afforested. All of the present agricultural land would have been densely forested with a mix of native broadleaved trees – Birch, Hazel, Pine, Oak, Elm, Alder and Ash. The earliest farmers of the Neolithic period (4,000-2,000BC) began felling the forests and clearing land to plant crops and graze domestic animals. Forest clearance for farming and to supply timber for ships, cathedrals and even iron-smelting continued until the early 18th century, by which time most of the forest in Ireland had been cleared. However, with the development of the large estates began a process of planting trees - Littlewood is a good example, being planted by the Coyningham Estate sometime before 1840. Most of the trees planted were broadleaved, primarily oak which was such a valuable building timber – large stumps of oak are common throughout the forest. However, other types, non-native tree species were planted including Beech, Horse Chestnut, Sitka Spruce (from North America) and hornbeam. The State Forest Service bought Littlewood from Lord Mountcharles in 1965. All the large oaks were felled for commercial use and the area was replanted with a variety of species but dominantly with exotic, fast-growing conifers tree species. Subsequently, Coillte, the present owners, have managed Littlewood by combining replanting with conifers but also allowing broadleaved species to mature and dominate in some areas of the forest. This management has allowed the woodland flora and fauna to continue and contributes to great biodiversity that persists throughout Littlewood today. A total of approximately 100 plant species have been recorded in Littlewood which makes it one of the most diverse woodland areas in the North-east of the country. This includes trees (about 20 species), flowers, grasses, sedges, ferns and fungi (mushrooms). 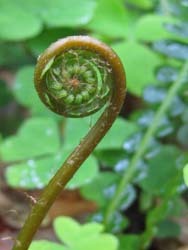 Many are unique to woodland habitats and some are quite rare. The plants of a woodland are especially adapted to flower early so as to make use of available light in the spring time, prior to the trees developing foliage and blocking out the light getting to the forest floor. Every spring time at Littlewood there are fantastic swathes of bluebells. Other less noticeable flowers include primrose, wood sorrel, sanicle and opposite-leaved saxifrage. 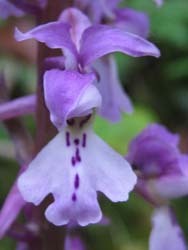 There are also a few areas deep in the forest where the beautiful Early-purple Orchid blooms and, rarest of all orchids, there are Broad-leaved Helleborines. If it is wet and warm in late summer and in autumn there is an explosion of fungi. There are at least forty species including the bold and bright Russulas and the dainty puffballs. Many more discreet species are very difficult to identify, and whilst some are delicious to eat others are deadly poisonous. Fungi are an essential part of any woodland since they play an essential part in decomposing all the leaf litter and returning it to the soil. One of the most unusual species is the Stinkhorn, which is common throughout the forest. The top of the Stinkhorn is covered in a slime which produces a sickly smell. The smell attracts flies from a large distance and the slime sticks to the flies and thus the spores of the mushroom are dispersed throughout the forest. The diversity of plants and trees within the forest is reflected by the variety of fauna. Ireland’s largest wild mammal – red deer – takes refuge in the forest, and graze in the surrounding fields. At the other extreme tiny wood mice forage throughout the forest at night time for berries, mushrooms, seeds and small invertebrates such as snails and earthworms. Grey squirrels, originally introduced into Ireland from eastern United States in 1911, used to be common in Littlewood. However, they seem have disappeared altogether. Co-incidentally, the Pine Marten has been discovered recently in the forest. The Pine Marten is a beautiful animal – it is like a small cat with a bushy tail (its Irish name, Cat Crainn, means ‘tree-cat’). They were almost extinct in Ireland but in the last few decades have made a remarkable recovery. Since Pine Martens are predatory carnivores it is possible that they caused the grey squirrels demise at Littlewood. 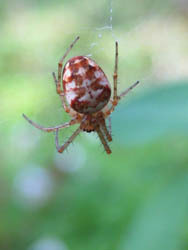 In summer the woodland provides habitat for hundreds of insect species, which are then a food source for bats, particularly around the edge of the forest where they fly freely catching up to 3,000 insects per night, including moths, which come in a wonderful variety of shapes, sizes and colours. Spring in early morning is the best time to hear the cacophony of bird song as all the male birds call out to mark their territory within the forest. The smallest bird in Ireland is the Goldfinch and this is one of the few species to thrive in the coniferous parts of the forest. At the other end of the scale is the Buzzard, which is like a small eagle and can be seen hovering above the forest throughout the year – like the Pine Marten it was once almost extinct. Although hard to distinguish, the largest member of the crow family, the Raven, can be heard often in the tree tops with its distinctive raucous call.